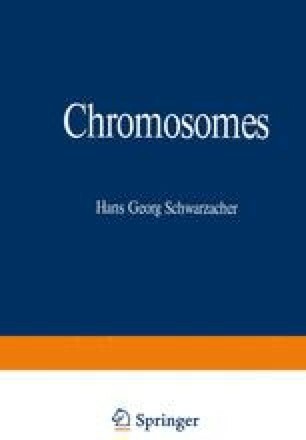 Chromosomes are the dense and intensely stainable small bodies, first described by Flemming (1882), Strasburger (1882), and van Beneden (1883). The name “chromosome” was proposed by Waldeyer in 1888. Form and number of chromosomes are species specific. In general they appear as small threads or sticks about l–2μ thick and several μ in length. In most species all cells of an individual have at least one complete set of chromosomes. In each mitotic division occurring in any tissue the same form and the same basic number of chromosomes are found. They are equally distributed to the daughter cells so that each contains the same chromosomes as the mother cell. Before the chromosomes divide they are replicated (or reduplicated) in the mother cell.